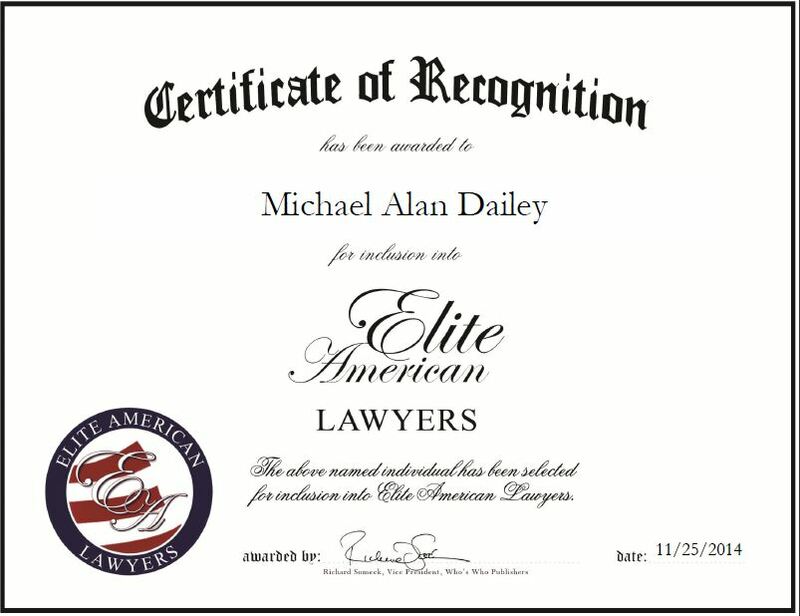 Michael Alan Dailey is experienced litigator with 37 years of experience. He has presented and defended cases throughout the United States, including disputes involving health care, global positioning, and voice recognition technologies. Mr. Dailey is an AV Pre-Eminent Attorney, LexisNexis/Martindale-Hubbell who specializes in commercial litigation and trial work. For the firm, he has been credited with negotiating a $300,000 sexual harassment recovery without even filing suit, securing, within eight days of suit having been filed, a $1.5 million securities recovery against a major software services provider, on behalf of a group of founding company shareholders, and winning a settlement in the amount of $825,000 – the precise amount sued for – on behalf of a commissioned salesman suing one of the world’s biggest and best known technology service providers. Mr. Dailey also recovered $2.2 million for his client in a trademark infringement and trademark dilution action against one of America’s largest magazine and newspaper publishers, successfully defended a software developer at trial from $3.5 million in asserted damages stemming from claims for misappropriation of program code and design, and secured a verdict exceeding $20 million against a group of defendants who utilized a variety of off-shore companies to conceal their unlawful operations. Mr. Dailey takes great pride in his work and is often asked to speak at conferences on a wide range of topics. A fellow of the American Bar Foundation and Chartered Institute of Arbitrators, Mr. Dailey would like to get more involved in international cases in the coming years. This entry was posted in Litigation and tagged commercial litigation, disputes, health care, settlements, technology, trail work. Bookmark the permalink.